Kosovo is today one of the most disputed territories in Europe and a real Balkan powder keg which can explode again at any time. It is a province within the Republic of Serbia, recognized as such by both Serbia’s constitution and the Resolution 1244 by the Security Council of the United Nations (the UNSC Resolution 1244, June 10th, 1999). However, Kosovo parliament with a clear Albanian majority proclaimed the independence of Kosovo (without a referendum) in February 2008 that was recognized by the majority of the Western countries followed by their puppet clients all over the world (in reality, today around 90 states). Nevertheless, since Serbia received the status of a candidate-state for the full EU membership in March 2012, the intensive negotiations between Belgrade and Prishtina about the ultimate status of Kosovo are going on under the umbrella of EU and today they are, in fact, entering the final stage. Kosovo is the birthplace of the first independent Serbian state in the Middle Ages, a center of Serbian state authorities, church, culture and civilization, and the location where Serbia fought a decisive battle (Kosovo Battle) in 1389 against the Muslim Ottoman invaders, protecting Christian Europe from the Orientalization and Islamization. 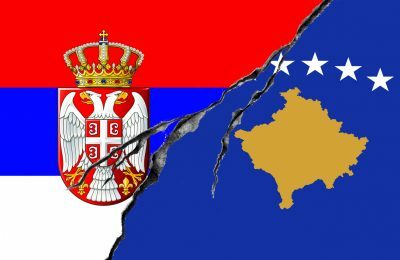 What, in fact, the EU requires from Serbia in the current negotiations between Belgrade and Prishtina on the final status of the province is to recognize the independence of self-proclaimed Republic of Kosova for the very foggy promises about faster (in 2025) Serbia’s EU membership. In order to make clear historiographical and political picture on the Kosovo issue, in the following paragraphs we are going to correct the basic Western misconceptions about Kosovo which are present in the mass media, popular literature but as well as in the academic publications even by the most prominent Western universities, institutes, and other organizations. In particular, the text is a critical contribution to one of the most misleading (quasi)academic publications on the Kosovo issue with a very bombastic title: Judah T., Kosovo: What Everyone Needs to Know, Oxford University Press, Oxford−New York, 2008. Wrong. It is a part of the conflict between Balkan Albanians and the surrounding populations, in Montenegro, Serbia, Macedonia, and Greece (for instance, clashes between Albanians and Macedonians in Macedonia from 1991 onward including an open rebellion in 2001). Wrong. The crux of the matter lies at the biological level. The real rationale is a demographic explosion which is going on within the Albanian population for a century or so (rate of growth by Albanians four to five time faster than the average rate in other European countries) and the ensuing expansion for Lebensraum and the creation of a Greater Albania. Wrong. It is Kosovo and Metohia, abbreviated KosMet. Kosovo itself is an abbreviation of Kosovo Polje, what in the Serbian language means Blackbird Field (in German Amselfeld). Metohia is a corrupted Greek name for Metohi, meaning dependency to the monastery, referring to the land bestowed by Serbian kings and other rulers to the monasteries and churches in KosMet like of Pecka Patrijarshija, Dechani, Grachanica, etc. (the 13−14 century). Therefore, Albanians are omitting the term Metohia from the name of the province in order to hide its historically Serbian character. Wrong. In the last reliable census carried out at KosMet in 1961, Shqipetars constituted 67% of the overall population, with (predominantly) Serbs and others sharing the rest. As for the subsequent censuses (1971, 1981, 1991), Shqipetars refused to take part in them. All figures quoted for the period after 1961 are estimates only. Wrong. In the Middle Ages, KosMet was the central part of Serbian state, culture, and civilization. Shqipetars were a tiny minority (about 2%, according to the Ottoman census in 1455), nomadic herdsmen mostly. They came to KosMet from North and Central Albania mainly after the First Great Serb Migration in 1690 from KosMet to Vojvodina (at that time part of the Habsburg Empire), after an abortive uprising against the Ottoman rule in 1689. When KosMet was liberated from Ottoman rule in 1912, by Serbia, Serbs and Shqipetars shared equally the overall population there (50% versus50%). All original toponyms (place names) at KosMet were and are Slavonic-Serb, except for a very few of them (contrary to the case in Central and South Albania). The Albanians even do not have their own name for Kosovo that is coming from their own language and, therefore, they are using a modified Serbian origin (Kosova or Kosovë). The word Kos (as the foundation of the toponym) does not exist in the Albanian language. However, since 1999, many original toponyms in KosMet are deliberately Albanized or renamed in order to lose a Serbian character. Wrong. It is the most fertile land in Serbia (apart from Vojvodina). The average DNP per family is the same as in the rest of Serbia. It is low only if counted per capita since the Shqipetars’ family has six times more children than Serbian family (and former Yugoslavia’s one, for that matter. We are referring to a proper family here, not to the so-called fis, extended Shqipetar family, which may comprise hundreds of members). In fact, accounting for the fact that proportionally more Shqipetars are working in West Europe, their incomes are not accounted for when estimating family earnings and KosMet appears better off than the rest of Serbia. That KosMet is a prosperous region can be verified by direct inspection at the spot. KosMet is the biggest coal reservoir in Europe. Wrong. It is a common goal of all Albanians to live in a single (unified) national state of (a Greater) Albania. The political program of a Greater Albania is designed in 1878 by the Albanian First Prizren League (1878−1881). This aim has been practically already achieved. KosMet has been practically annexed by Albania as there is no real border between KosMet and Albania. As for West Macedonia, it is a matter of the near future. The next step is Cameria, as South Epirus (today in Greece) is called by Albanians followed by East Montenegro. Wrong. The process of Shqipetar’s committed ethnic cleansing of KosMet goes on for the last century and refers to all non-Shqipetars (Roma, Turks, Croats, etc). It is a clear case of well-planned ethnic cleansing whose rationale is an extreme xenophobia. As a matter of fact, Albania appears the purest ethnic state in Europe, 98%, with Greeks, Slavs, Jews, Roma, etc. banished in one or other way. After NATO’s occupation of KosMet in 1999, the ethnic “purity” has reached the figure of 97%. Wrong. Since Serbia’s contribution to the Yugoslav Federal Fund for the undeveloped regions matched exactly the amount donated by the Fund to KosMet, it was, in fact, Serbia which helped KosMet to construct the infrastructure, schools, the Prishtina University, hospitals, factories, mines, etc. Further, since the Shqipetar population consists mainly of children and teenagers, who used to get children allowance, it was another source of enormous income from the rest of Serbia, which had on average less than 1.5 children per family (as compared with 8 with Shqipetars). Wrong. Although they are not publicized, the maps of that projected unified national state of all Albanians do appear occasionally in the Western press, either explicitly, or as the region with a predominant Albanian population. The point with the latter is that these regions exceed the (semi) official maps of the future united Albanian state, and even include regions without Albanian population at all. Wrong. They appear in the mid-11th century in the Balkan history and their origin appears uncertain (most probably they came to the Balkans from the Caucasus Albania via Sicily, according to one Byzantine sources, in 1043: Ataliota M. Corpus Scriptorum Historiae Byzantine. Bonn: Weber, 1853). As for the claims of Illyrian heritage (which is more a political wishful thinking than a very historical fact), distinguished English linguist Potter wrote: “Some would associate it with extinct Illyrian, but with so doing they proceed from little known to the unknown”. Wrong. This region was not included into the KosMet (autonomous) region after the WWII, for the simple reason that Shqipetars were a tiny minority at that time there. Now, many villages, which were purely Serb, are inhabited exclusively by Shqipetars. The influx from KosMet, plus the enormous natural birth rate, made this population to be a majority in two of three rebellious counties. Due to this fast change in the ethnic structure, and due to the large percentage of young people not eligible for voting, Shqipetars’ representatives there are not proportional to the overall share of the population in the region. In fact, the Preshevo issue is a paradigm of the Albanian syndrome, as conspicuous at KosMet, and at Macedonia. First comes land occupation, then fight for the “political rights” and finally secession. It is the system which Henry Kissinger called “Domino Game” (referring to the Communist tactics in spreading over the borders). What Slobodan Miloshevic did at Kosmet in 1998 was much the same as J. B. Tito did in 1944−1945, after the Albanian rebellion of the Kosovo Liberation Army (the KLA) at Drenica (February 1998), when the military rule had to be imposed in the province. Wrong. After the World War II, more than 250.000 non-Shqipetars moved from KosMet due to the “demographic pressure”, not to mention violence. After NATO’s “humanitarian intervention” in 1999 at least 200.000 (according to some claims up to 300.000) non-Shqipetars fled away from massacres (including and Muslim Turks, Muslim Gorani, Muslim Roma population, etc.). At the same time, more than 200.000 Albanians moved to KosMet after the WWII (most probably even more than 300.000), and about 300.000 after the expulsion of non-Shqipetars in 1999. As for the shrines, they are protected in the same manner as the synagogues in Germany by the NSDAP party members. Only from 1999 to 2001 about 100 monasteries and churches have been leveled to the ground at KosMet. The peak of KosMet Albanian organized ethnic cleansing and destruction of Serb Orthodox shrines came in March 2004 (the „March Pogrom“, March 17−19th, 2004). In sum, during the last 20 years, up to 150 Serbian shrines are ruined by local Muslim Albanians in KosMet followed by erecting of many new mosques as a part of the project to transform the province into the Islamic Caliphate of Kosovostan. Wrong. It was much reduced during the communist regimes in the area (Albania, Montenegro, KosMet), but has been revived after the “democratic governments” have taken power in Albania. It is widely spread at KosMet, despite the opposite claims by the local politicians. In fact, the persecution and expulsion of non-Shqipetar population in 1999 was experienced by Shqipetars as a collective blood feud as it is, for instance, recognized by Shqipetar girl Rajmonda from KosMet in the British Channel 4 documentary movie „Why Rajmonda Lied“ (June 1999). Wrong. It has no control whatsoever over the local population, in particular the irregulars of the KLA, turned into mock police forces. The whole region, y compris North Albania (and Montenegro for that matter) is the European center for drug traffic and smuggling of arms, tobacco, humans, etc. There is no proper juridical system, no effective police, prisons, etc. What KFOR/EUFOR can do the most is to protect itself, but it is well aware that when Shqipetars conclude the UN/EU presence is a nuisance for them, international forces will be expelled easily. A single step from “protection force” to hostages would be sufficient, and everybody at the spot is aware of that. Wrong. They are directly involved, at all levels, from financing, organizing, training, arms supplying, diplomatic supports, etc. Training camps at North Albania, KosMet, and Macedonia are lead by American instructors, who are engaged even at the front line, as several years ago the case with Arachinovo near Skopje illustrated, for instance. Wrong. All events that lead to the violation of human rights and massacres were induced by Americans and (to a lesser extent) by Germans. Nothing of those would have happened had not the NATO (sic) intervened in the region. The USA is interested in the peace, not in the justice. Since Albanians do not appear convenient interlocutors for political discourse, Americans insist to the rest to submit to the Albanian demands, who have made their political goals their political rights! As a “collateral gain”, USA has an important stronghold in the region (like the military base Bondsteel at KosMet), a secure (sic) passage for the oil pipeline from the Caspian Sea, via Bulgaria, Macedonia, and Albania, to the Adriatic coast, etc. Another “collateral gain” is, of course, a free traffic of heroin from Afghanistan (occupied and controlled by the USA in 2001) through the area, right to American schools, colleges, etc. (among other destinations). It is a claim that even 90% of the West European drug market is controlled by Albanian narco-dealers. Wrong. It was a responsibility of the government of Serbia to protect the interest of the state of Yugoslavia (the Federal Republic of Yugoslavia – Serbia and Montenegro), in face of a violent rebellion. The manners these state affairs have been conducted, including all eventual misdeeds committed over civilians is a matter of humanitarian concern and should be cleared up at the Hague Tribunal (or other international tribunals for the war crimes). But it does not justify the bombing of Yugoslavia nor deprivation of a state to conduct its internal affairs. We have to keep in our minds the fact that the ideas of “Humanitarian Intervention” and “Right To Protect” (R2P) do not assume the act of a military intervention, at least not without a formal sanction by the UNSC. KosMet issue is much older than Slobodan Miloshevic and much deeper than disputes over political rights and state borders. The affairs in Macedonia in 2001 (open Albanian rebellion against the central government in Skopje) clearly demonstrate this. Wrong. His political (sic) manners only provided an excuse to Slovenia and Croatia for leaving Yugoslavia. The real rationale for this understandable decision was to leave the state that was burdened with the time bomb called KosMet, which the federal police hardly dismantled in 1981. And, of course, Slovenia and Croatia decided to leave Yugoslavia, a country in which they could not enjoy any more a privileged economic and political position as they used to have after the WWII. The same applies, mutatis mutandis, to the dispute between Montenegro and Serbia from 1999 to 2006. Wrong. The international community does not comprehend the nature of the problem, for good reason, since it is not a political one, but a clash between a Middle Age (tribal) mentality and a (quasi) modern European standard of civilization. The only reasonable way towards a permanent and rational solution would be an agreement between Serbia, Montenegro, Macedonia, Greece, and Albania, on mutual responsibilities and a civilized settling down of this Balkan affair, without interference from the outside, certainly not from the USA. If the USA wants to compete for a role of an arbiter, they should first qualify by helping a permanent settling down of the Palestinian issue in the Middle East. Wrong. Kosovo is not disputed land between Serbia and Albania as Albania’s officials never officially claimed this province to be included into Albania. It is disputed land just between Serbia’s authorities and Kosovo Albanian separatists. The Albanians never claimed Kosovo to be either central or very much important region to their cultural identity as it was never a reality in the Balkan history. Kosovo (KosMet) is central to Serbian cultural identity but for the Albanian cultural or/and national identity Kosovo (Kosova) was all the time just a periphery territory on which up to the beginning of the 18th century Albanians have been a very tiny minority. Wrong. Skanderbeg (George Kastriot Skanderbeg) was not of the Albanian origin but of the Serb. His family coat of arms, that is today Albania’s coat of arms, was of the Serb feudal family but not of the Albanian one. The Albanians, therefore, simply appropriated the Serbian feudal family and their insignia as their own. Wrong. This is the biggest falsification of historical truth followed by a dirty political propaganda by the West. Serbia simply liberated her own land during the First Balkan War in 1912−1913 that was occupied by the Ottoman Empire since 1455. KosMet was up to the Ottoman occupation part of Serbia, even known as Serbia proper, but it was never part of Albania. In the mid-14th century, Kosovo’s city of Prizren was Serbia’s capital, known as Serbian Jerusalem, and Kosovo’s town of Peć was a center of an independent Serbian Patriarchate. However, after the Balkan Wars in 1913, present-day territory of KosMet was divided between Serbia and Montenegro – West KosMet (Metohija) went to Montenegro and East KosMet (Kosovo) went to Serbia. Subsequently, if Kosovo was “occupied” before the WWI it was “occupied” by both Serbia and Montenegro but not only by Serbia. Wrong. After the WWII the Yugoslav authorities forbade by the law to all expelled Kosovo’s Serbs (100.000) during the WWII, when KosMet was a part of Mussolini/Hitler’s established Greater Albania, to return back to their homes which were occupied by Albanians. It was repressed the Albanian policy of secessionism and the continuation of a terror against the Serbs but not Albanians as a nation or ethnic group in Kosovo. Moreover, the Yugoslav authorities after the WWII very welcomed Albanian migration from Albania to KosMet when around at least 200.000 Albania’s Albanians were settled in KosMet who were getting quickly a Yugoslav citizenship. Nevertheless, at that time, Kosovo’s Albanians enjoyed much more human and minority rights in comparison with, for instance, Croatia’s Serbs, Albania’s Slavs, and Greeks or Turkey’s Kurds. It was not recorded any single case that any Kosovo’s Albanian after the WWII emigrated to their motherland Albania where they would enjoy a complete set of protected national rights. The military bunkers build up by Albania’s authorities after 1945 on the border with Yugoslavia had the purpose not to protect Albania from the Yugoslav invasion but rather to stop the massive migration of Albania’s citizen to Yugoslavia. Wrong. By dismissal of Aleksandar M. Rankovic in 1966 (“Briuni plenum” of the communist party of Yugoslavia held in Croatia), it was deliberately opened the doors for the decomposition of Yugoslavia including and Kosovo separation from Serbia. The consequences of such anti-Serbian policy by the central government of Yugoslavia (occupied primarily by the Croats and Slovenes) was a new destructive constitution of Yugoslavia in 1974 according to which, KosMet de facto became a separate territory from Serbia. Autonomous status for KosMet was not given in 1974 but rather in 1945 – in 1974 the Albanian-run KosMet administration received tremendously higher level of autonomy that was, in fact, a republican status within Yugoslavia having its own parliament, government, police security forces, Academy of Sciences and Arts, press, University of Prishtina (with the Albanian language study programmes), constitution, and the presidency. Such a level of autonomy did not enjoy, for instance, any of autonomous regions in the USSR. Furthermore, under A. K. Rankovic’s authority, the Yugoslav security forces (OZNA) exterminated at least 70.000 civilians in Serbia immediately after the WWII that was 3,5 times higher grade in comparison to the number of killed Kosovo’s Serbs by Albanians during the WWII. Wrong. After the death of a Yugoslav dictator Josip Broz Tito (1982−1980), who was of the Slovenian-Croatian origin and who was supporting Kosovo’s separation from Serbia, Kosovo’s Albanians were protesting for the purpose to separate this province from Serbia and Yugoslavia. Some of the protesters required Kosovo’s incorporation into Albania. However, at that time there were ethnic Serbs and Montenegrins who were discriminated by Kosovo’s administration (governed by the Albanians) followed by a massive exodus of the Serbs and Montenegrins from the province due to the Albanian-run policy of the terror. Wrong. The last reliable population census in KosMet is of 1961 as censuses of 1971, 1981 and 1991 are arbitrary estimations by Yugoslav authorities as KosMet’s Albanians boycotted them in order to present the fake population structure of the province. Therefore, the Albanian majority in KosMet is estimated as higher as possible while the Serb minority is presented as lesser as possible. Albanian extremely high birth rate in KosMet after the WWII up to 1999 was primarily a product of political design to claim the province on the bases of ethnic rights. Today, when KosMet de facto is separated from Serbia, the birth rate of ethnic Albanians is the same as of the Serbs for the very reason that political necessity for the extremely high birth rate of the Albanians disappeared. After the WWII, the Serbs were leaving KosMet not because of the economic reasons but rather as they were discriminated, terrorized and/or brutally expelled from their homes by the local Albanians including and by the neighbors who were immediately appropriating their lands. It is true that many Serbs sold their homes and land to the Albanians but it was done under the pressure and even direct threatening of the physical extermination. Wrong. The autonomy was not canceled as it was just reduced from the political independence to the national-cultural rights in order to prevent further separation of the province from Serbia and to stop the ethnic cleansing of the Serbs. The level of autonomy which KosMet’s Albanians, as a national minority, enjoyed before 1989 in Serbia is not recorded in world history of the protection of the rights of national/ethnic minorities. However, for the matter of comparison, at the same period of time and even today, the Kurds of Turkey, the Corsicans of France or the Sardinians of Italy were/are not even recognized as ethnic minorities in their countries. The Albanians of Macedonia or Montenegro within ex-Yugoslavia did not enjoy any kind of national/ethnic territorial/political autonomy as it was also the case with the Serbs in Croatia or Bosnia-Herzegovina who could only dream to get the autonomy status enjoyed by KosMet’s Albanians in Serbia. To be honest, at the same time, there was no any migration of KosMet’s Albanians to Albania where they would enjoy a full scale of national rights, but it was rather the opposite way that Albania’s Albanians were coming (illegally) to KosMet where they were “oppressed” on national/ethnic basis. Wrong. The war started at the very beginning of 1998 as a consequence of Albanian-led terrorism actions against Serbia’s state authorities and non-Albanian civilians followed by counter-terrorism operations by Serbia’s security forces being in no connections with the elections which came later. Legitimate Serbia’s central authorities did not recognize the 1998 KosMet’s parliamentary and presidential elections as they were organized by Albanian-led underground provincial quasi-state authorities who boycotted previously organized legal elections by Serbia’s government. The illegally elected Albanian parliament in KosMet was dissolved by Serbia’s police in 1998 when “elected” quasi-President of Kosovo Ibrahim Rugova was sworn in the parliament of neighboring Albania. However, the core of the problem starts, in fact, when the Socialist Federal Republic of Yugoslavia (SFRY) broke up but no agreement was achieved in changing of the borders. One-sided separation of some federal unites – republics was allowed to occur and that was the principle that was respected from the beginning till the end of the Yugoslav crisis. Since Kosovo enjoyed in SFRY the status of territorial-national autonomy within Serbia (likewise Vojvodina) the demands for independence have not be supported by the international community. However, encouraged with Slovenian, Croatian, Macedonian and Bosnian independence (internationally recognized) the greatest hard-liners within the Albanian national movement in KosoMet – followers of Redzep Cosja, a member of the Kosovo Academy of Sciences and Art, championed Kosovo’s independence with a final task of joining Kosovo to Albania (the wish publicly confirmed in 1997 by Kosovo’s Albanian leader – Dr. Ibrahim Rugova). Actually, according to the idea and the things this line pleads for in politics, the mother state of Albania would gather together all “Albanian lands” or the territories populated by the Albanian inhabitants who are there in majority. Wrong. No single evidence that Serbian authorities had any plan or developed programme of ethnic cleansing of the ethnic Albanians in KosMet. That such plan and/or programme existed (the so-called “Horseshoe”) it was a dirty propaganda and fake news launched by German intelligence service later proven to be a pure lie (for instance by in 1999 a German chancellor Gerhard Schroeder). The NATO did not act in order to protect Albanian civilians from Serbian police and Yugoslav army but it intervened in order to save already heavily beaten terrorist KLA whose members fled to neighboring Albania and Macedonia and to pave a ground for its own occupation of KosMet after the war. The NATO’s airstrike campaign (March 24th−June 10th, 1999) was not a humanitarian intervention as it was rather a brutal military aggression (even using the rockets with forbidden depleted uranium) on a sovereign country by the breaking international law as it was done without any permission by the UN. If we can speak about humanitarian intervention in KosMet than it was rather the intervention by Serbia’s security forces and Yugoslav army in 1998 in order to prevent further ethnic cleansing of the Serbs by Albanian separatist KLA. Nevertheless, the Kosovo War and NATO’s aggression on Yugoslavia (Serbia and Montenegro) were permanently covered by the Western corporate mass media lies based on the false flags (for instance, the so-called “Rachak Massacre” in January 1999) and fake news. The fundamental lie was that KosMet’s Albanians are taking refugee (up to 700.000 according to CIA’s sources) in order to avoid massacres by Serbia’s security forces and Yugoslav army as, in fact, the refugee crises was inspired by two fundamental reasons: 1) the NATO’s airstrikes and massive bombardment, and 2) to present (fake) cases of Serbian alleged “ethnic cleansing” in order to win political propaganda in the Western mass media which supported Albanian case at the full extent. After the war, it became quite clear that the Western propaganda claims about 100.000 killed Albanians during the war was a lie as only the bodies of 3.000 victims are found of all nationalities and ethnic groups. Nevertheless, the Western propaganda did not report neither any single case of Serbian victims and refugees during the war or about criminal activities and war crimes committed by Albanian terrorist KLA that was well equipped, supported and financed by the NATO and especially the US (similar case was in Afghanistan in the 1980s with the Taliban rebels). Wrong. KosMet was, in fact, occupied after the Kosovo War not by “international community” but exactly by five NATO’s member-states (France, USA, Germany, UK, and Italy) which each occupied different sectors of the province. Therefore, the US plan before the war was fully accomplished: the NATO occupied the province that was before evacuated by Serbian police and Yugoslav army leaving non-Albanian population at the mercy of the KLA which took the full scale of terror, expulsion, ethnic cleansing, and genocide on KosMet’s Serbs and to a certain degree on other non-Albanians. The mission of KFOR and later EULEX is not to bring stability, democracy, and prosperity to the province but rather to transform KosMet into the ethnically cleaned region of a Greater Albania. Finally, Kosovo is today one of the most ethnically homogeneous territories in Europe, a center of drug smuggling and human trafficking to Europe from the East and governed by the corrupted Albanian client politicians, former members of the KLA. Wrong. This is the worst solution of all possible combinations which already directly provoked a chain reaction by numerous separatist movements around the world. The first of them were of South Ossetia and Abkhazia in August 2008 followed by the Crimean separatists backed by Russia’s federal government who well exploited the case of “Kosovo precedent” for the re-inclusion of the Crimean Peninsula into Russia in 2014. The Catalan separatists proclaimed a formal independence from Spain in 2018 exploiting the Kosovo case too. As a matter of fact, the creation of independent Kosovo was a long-time option among the Yugoslav Albanians which was not rejected by the Western part of international community as thoroughly unacceptable. However, in this case, it should be respected the principle that the borders could be changed only by peaceful means and with the agreement of the parties concerned – the principle already adopted by the EU in the case of the bloody destruction of ex-Yugoslavia in 1991−1995. However, taking into consideration the public opinion as well as the opinion of the most important political factors in Serbia, who decisively were rejecting such possibility, the realization of this option was possible only by a war (the Kosovo War in 1998−1999) between Serbia’s central authorities and Kosovo’s Albanian extremists (KLA). Considering this reality, the moderate Albanian separatists from Kosovo advocated the strategy “step by step” (from the 1990s) by supporting the modality of achieving the status of republic or confederal unit under international protection, what would in the future open the possibility for a less painful secession. However, KosMet with the status of a highest autonomy (the “Hong Kong” or “Scandinavian” models) within Serbia can be also dangerous as there would be created a precedent that would encourage minority communities in other states which make a compact majority in some territory to follow the same way (Kurds in Turkey) – this would turn the ethnic issue into the global issue of security. The danger of creation of independent Kosovo does not only lie in the fact that the official Belgrade is opposing this idea (likewise, for instance, Cypriot government), but also in the danger that the newly-created state would strive to get united with the neighboring areas populated by the Albanians (South Serbia, West Macedonia, East Montenegro). Thus would, by itself, endanger the security and stability in the region. Finally, the optimal solution for the Kosovo status is a “normal” autonomy within Serbia according to the international standards of protection of the rights of ethnic minorities but without any political-administrative prerogatives as it was the case in the SFRY from 1974 to 1989. Dr. Vladislav B. Sotirović is a former University Professor, Director of Democracy Rooting Centre, Founder & Editor of POLICRATICUS-Electronic Magazine On Global Politics Since 2014 (www.global-politics.eu). Contact: [email protected] He is a frequent contributor to Global Research. The original idea and first draft version of the text came from Prof. Petar V. Grujić (Zemun, Serbia). The text is written according to the orthography of the American (US) English spelling.